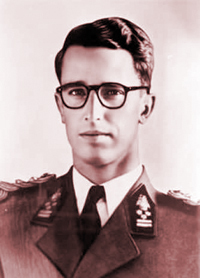 King Baudouin I was born in the Chateau du Stuyvenberg close to Laeken Brussels on September 7, 1930. He is the son of King Leopold III and Queen Astrid, born Princess of Sweden, and the grandson of King Albert I and Queen Elizabeth. He is a direct decendant of Josephine de Beauhamais, the wife of Napoleon Boneparte. His father Leopold III was unpopular, largely due to his second marraige to Mary Lillian Baels, a commoner, and his surrender to the Nazi Germany in 1941. Leopold eventually abdicated in favor of his son Baudouin who took the throne on July 17, 1950. On July 2, 1960 he married Dona Fabiola de Mora y Aragon. The couple had no children as all five of her pregnancies resulted in miscarriage. King Baudouin was a devout Catholic. When a law legalizing abortion passed the Parliament, he refused to ascent. In order to pass the bill, the government declared him temporarily unable to reign (at his request and with his consent) for 24 hours. Baudouin ruled for 42 years from July 17, 1950 until his death from heart failure on July 31, 1993. He was succeeded by his younger brother Albert who ruled as Albert II.